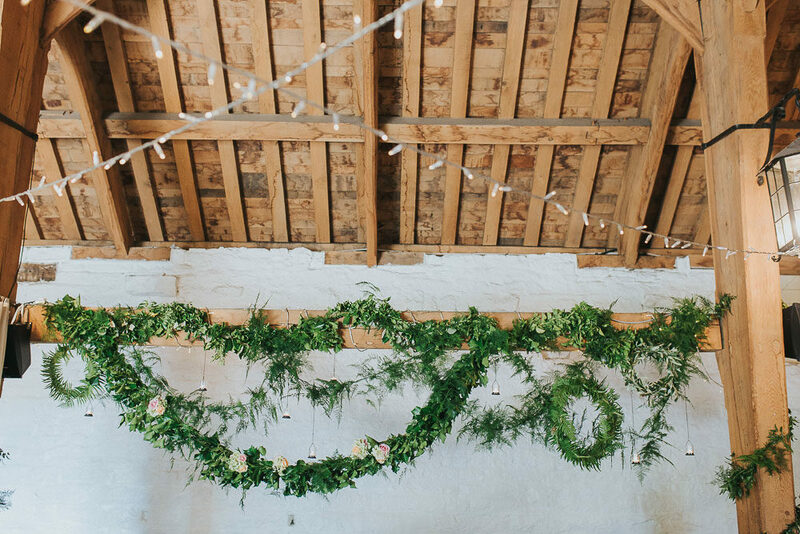 This rustic barn wedding at East Riddlesden Hall in Yorkshire is a little slice of heaven. 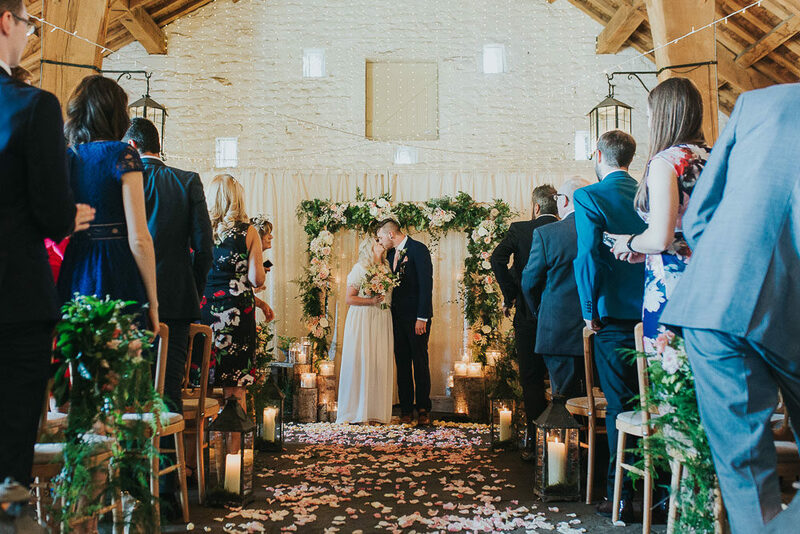 Absolutely full to bursting with blush blooms and delicious decor. 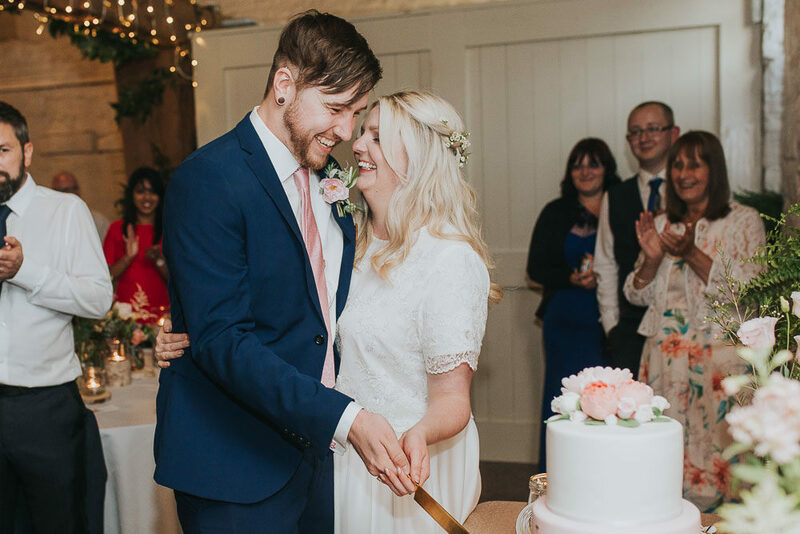 Plus many, many adorable pictures captured of bride & groom Kate & Dee by super talented Laura Calderwood Photography. 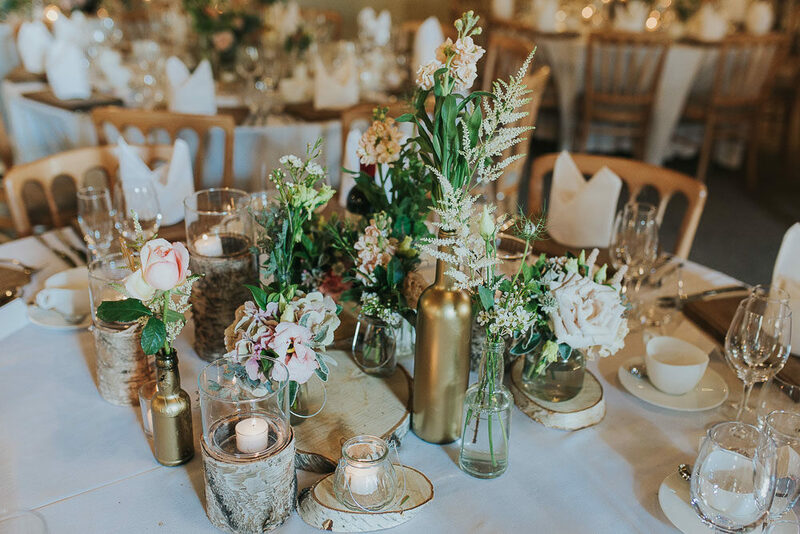 I have a feeling the table centrepieces of wooden tree stumps and slices, candles and flower stems in DIY spray painted bottles and jars will have your pinning fingers twitching, not to mention the immense flower arch altar. Now are you sitting comfortably? 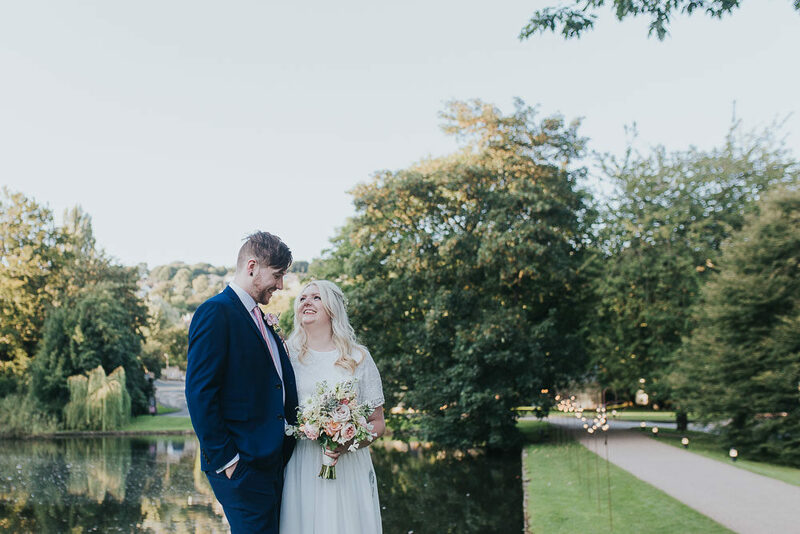 Then let this beautiful pink and gold Summer wedding warm your soul and distract you from the #beastfromtheeast. 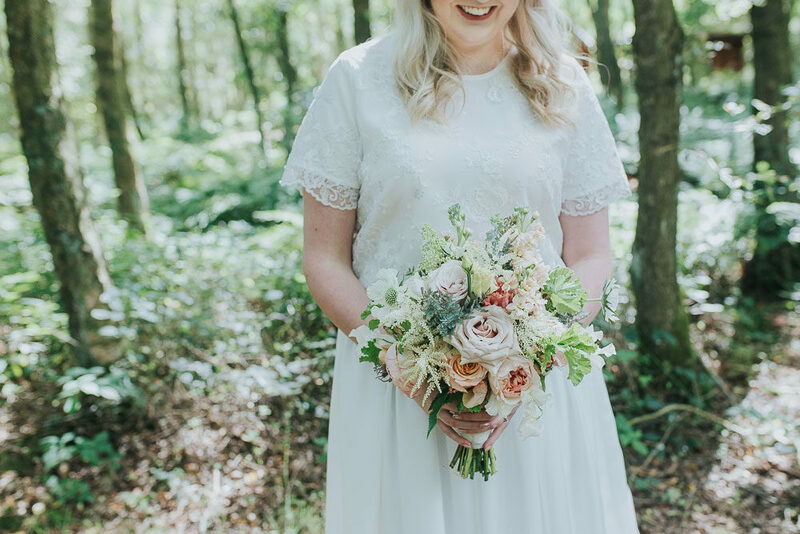 Kate the Bride: My wedding dress was custom made by a family friend. I couldn’t find the gown I wanted; everything seemed so expensive and I’d have to make adjustments/compromises. This way I got what I wanted, it was very comfortable all day, and it had pockets! I accessorised with jewellery from ASOS, an two pairs of bridal shoes. Some heels from Dune, and some gold Converse for the evening. Again, I just wanted to be comfortable! My make-up artist, Harriet Steele perfected the natural look! And Emily Hawkes took care of all our hair styles. I loved the twists, the bridesmaids’ hair looked particularly difficult. Dietrich wore a suit, shirt, tie and pocket square all from Next. We preferred to spend our money on the wedding itself. Ideally, we’d have got married outside, but we couldn’t rely on the weather. So a relaxed barn was the next best thing. 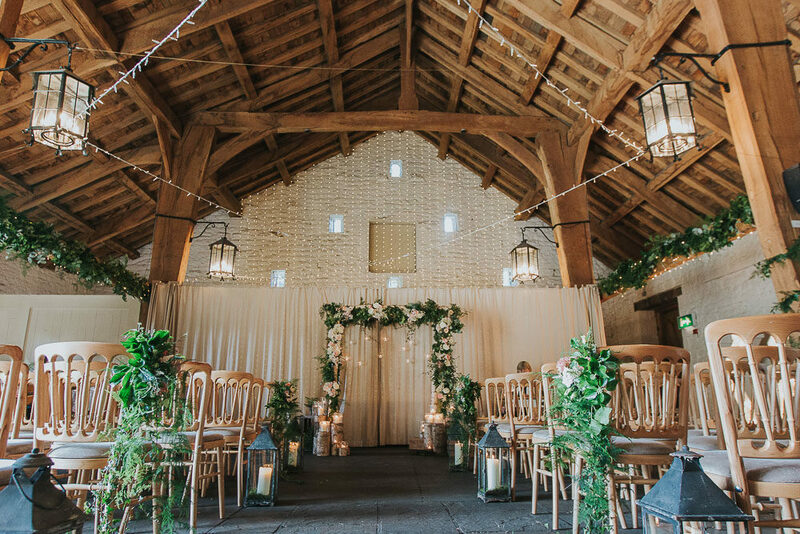 East Riddlesden Hall was the first venue we saw, and we chose it for it’s rustic feel, amazing surroundings and potential. Gold, coral, blush pink, white – We wanted something elegant and pretty, with a few stand out pieces. 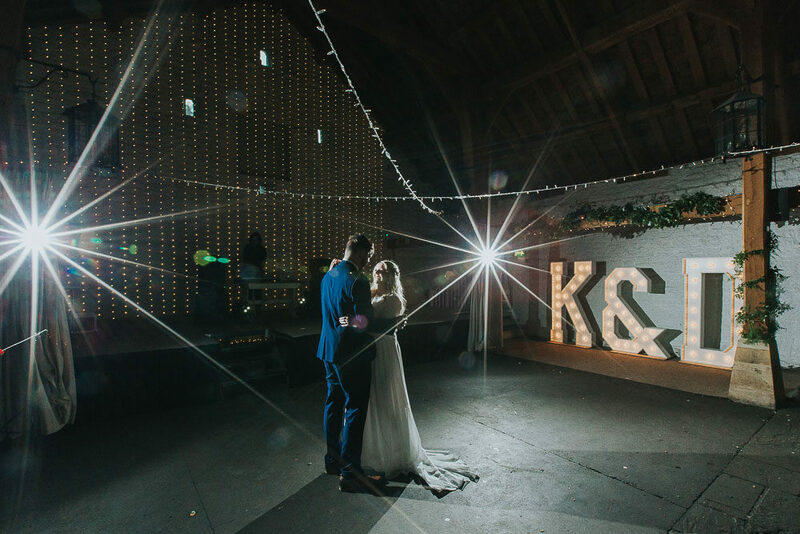 We got a few extra decorations from Typical Type, including a gold easel, festoon lights, giant light up letters K&D. Can’t really praise Stems enough for how they decorated everything. 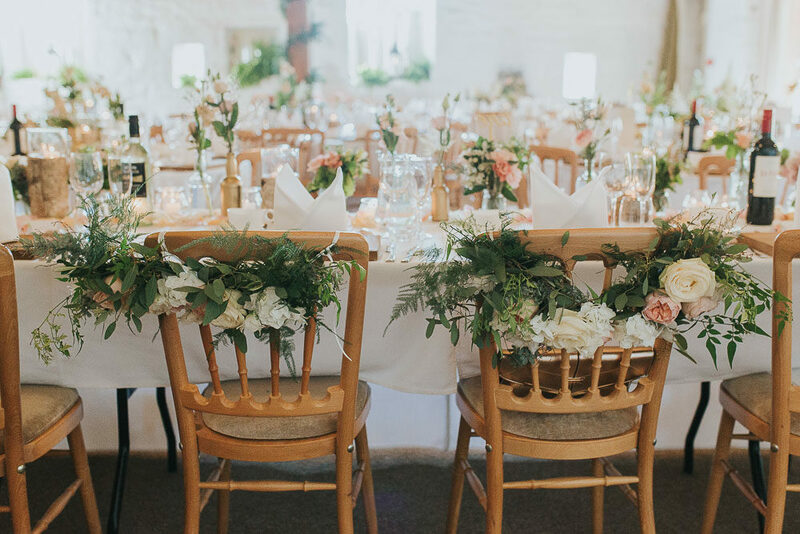 The arch, the bouquets, the tables and all the little bits dotted around were all done by Stems. I also loved the colour changing petals down the aisle, it certainly added an extra bit of magic to it. I let the bridesmaids pick whatever they wanted, as I didn’t want to restrict them or have them uncomfortable all day. I gave them a colour scheme and luckily they all picked dresses that worked together! I don’t know where they got them from, but Monsoon and Coach were definitely included. The Groomsmen suits all came from Next aswell, however, I think the Ebay sunglasses were an excellent (and cheap) addition! We didn’t really want any readings or songs. We’d been to so many boring/long church weddings. I enjoyed ours because it was quick and the party could start quicker! We had guitarist, Michael Mcaleavy play before and during the ceremony. Something lowkey and non-traditional. We’re quite into our rock/punk music, so were very happy to find a wedding DJ, Hi-Life, that could accommodate our taste. Hog and Apple did all our food, cake aside, and they didn’t disappoint. Our favourite was the Yorkshire Platter starter, with proper scotch eggs. We also have a hog roast in the evening, which went down well with anyone who had space to try some! Special thanks to Dietrich’s Mum, Louise, for the cake. She spent hours with me making sure she’d got the vision right, and learning how to make flowers and gold leaf. She even had the heavy fruit layer break a shelf in her kitchen (I’m told hysterics followed shortly after the shelf gave way). 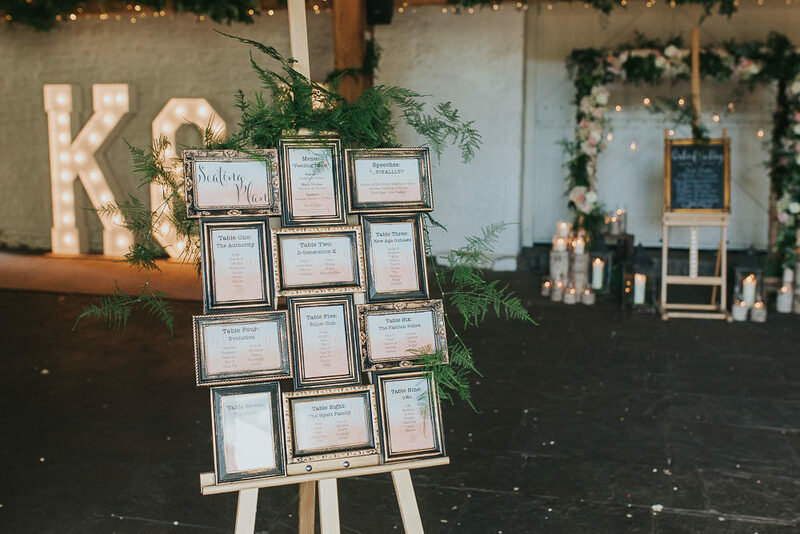 Laura Calderwood managed to capture the little details of our wedding and made everyone feel very comfortable, which is all you can really ask for! Loved the more candid photos and natural look. 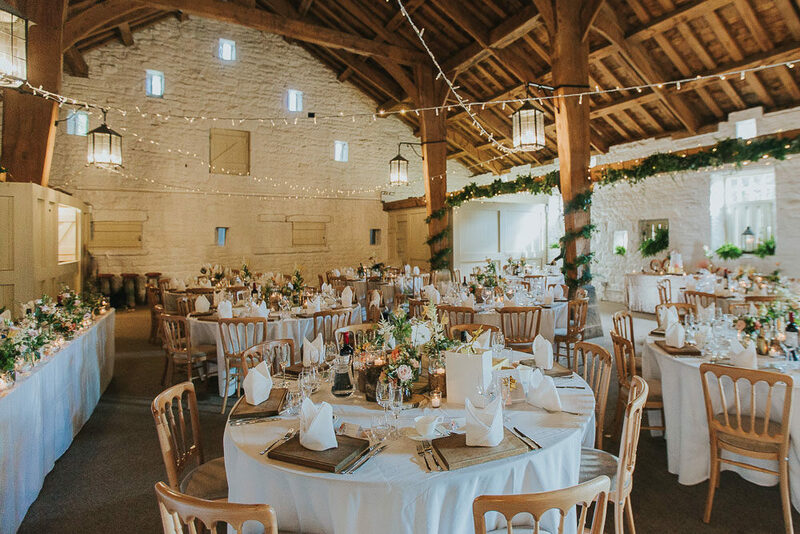 This looks like the perfect countryside wedding. 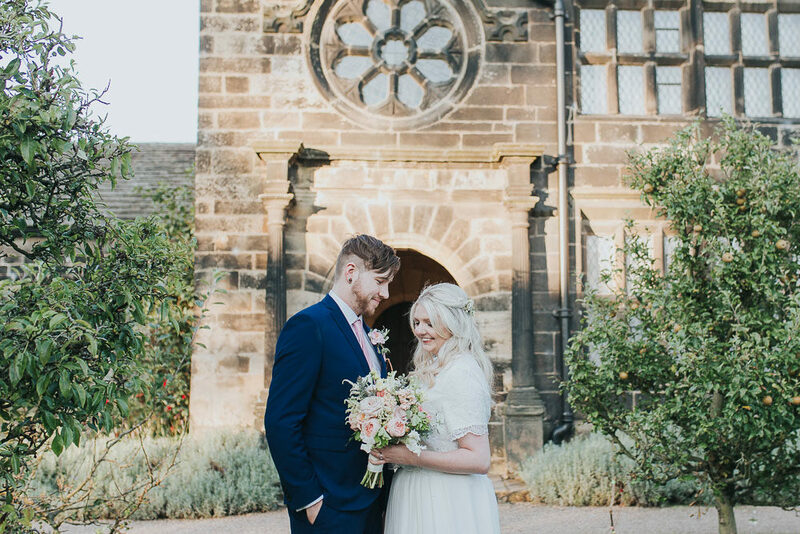 East Riddlesden Hall is a very popular wedding venue in Yorkshire. It’s full of history, and countryside and even has ducks!